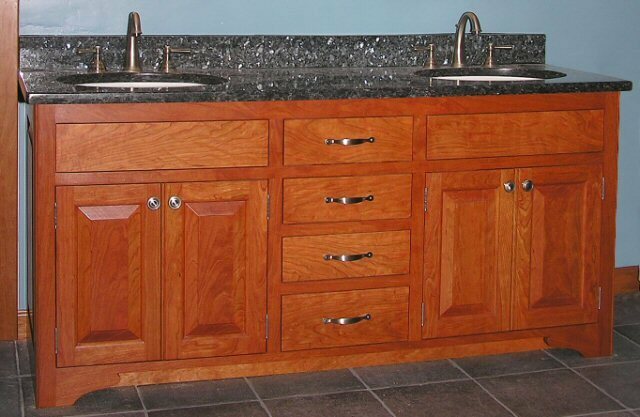 This is a two sink Cherry vanity. It is a more modern style using old style and modern finishes. The stain color on the cabinet is from Watco Danish Oil (Cherry) and the clearcoat is a precatalized lacquer (satin sheen). The doors are raised panel along with the side panels. 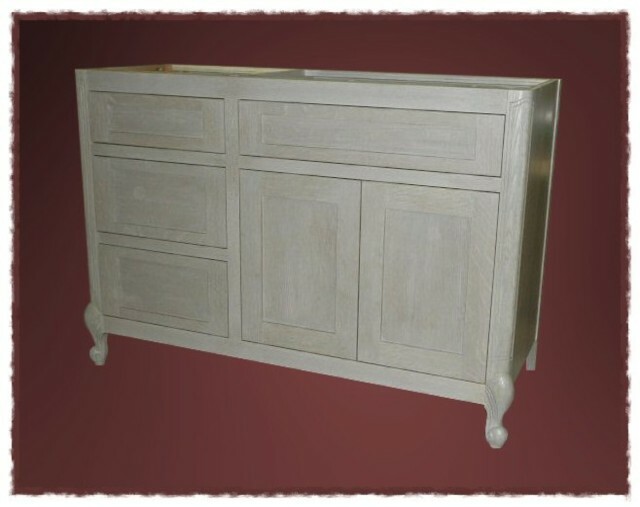 The drawers are flat and inset (door are inset also). The drawers are made from poplar and have traditional dovetail jointery, they ride on full extension ball bearing slides. This vanity resides in West Hartford, CT. This is a single sink beadboard vanity for a kids bathroom. 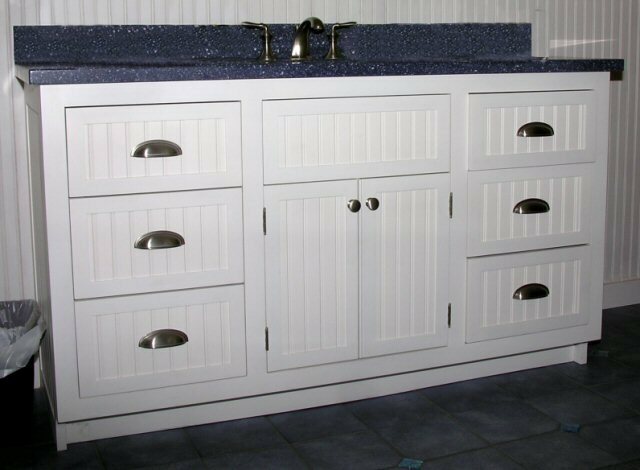 It has nickel plated bin pulls for the drawers and round pulls for the doors. It has old fashion mortise styled hinges for the doors to swing on. The drawers are melamine and ride on full extention ball bearing slides. The sides are beaded panels also. This vanity resides in West Hartford, CT. 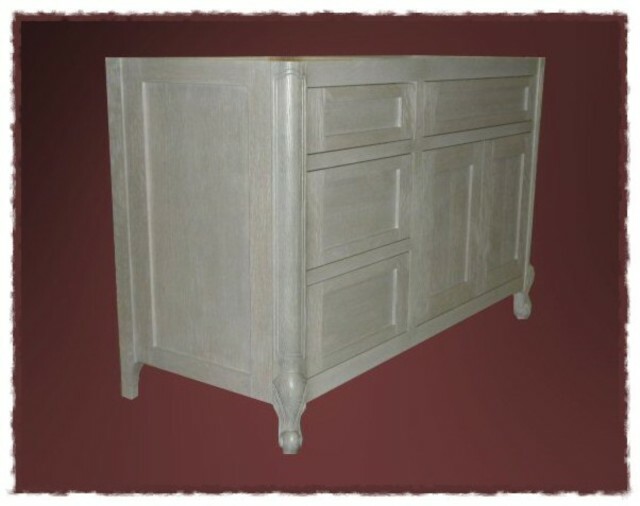 This is an 'L' shaped bathroom vanity designed with 18th century style. The doors have raised panels with 1/2" beaded styles and rails. The end panels are also of the same design. It has classic 'H' hinges and shaker style pulls typical to the 18th century. 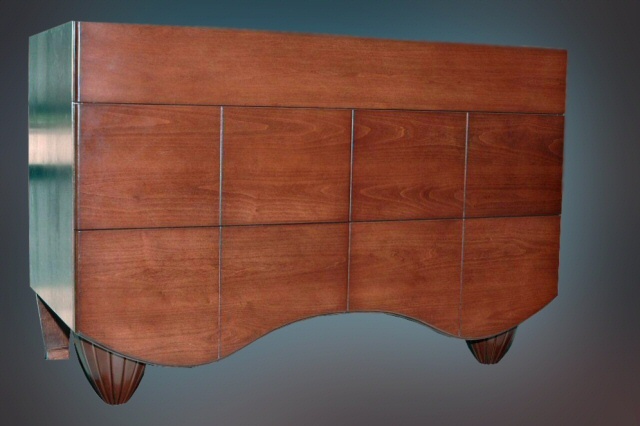 The drawer fronts (non-functional because of the sink) are flat faced with a bead routed onto the front 4 sides. 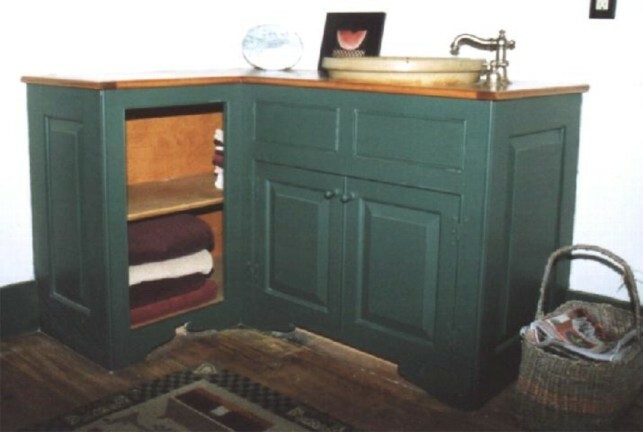 The cabinet is made from poplar which has been hand planed and painted in green. The counter top is made from pine, the ends are in breadboard style, it has been hand planed and stained with a honey color and polyurethaned. The round sink is raise out of the countertop and the faucets are set in at an angle and are nickel plated. This vanity resides in East Granby, CT. This is a mission style set of vanities. 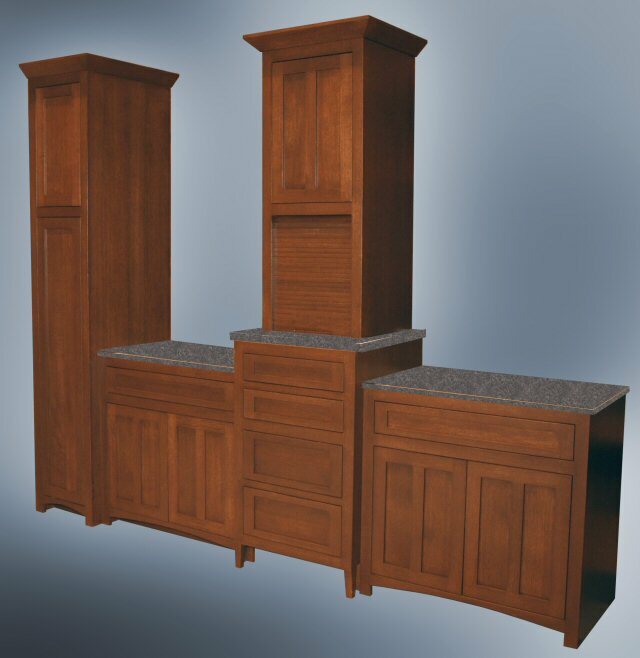 The tall cabinet is for storage of towels and linens, the two lower areas are for sinks, the center area is for general storage of bathroom amenities and the garage door will hide the hair care products for the lady of the house. The upper door in the center area houses a stereo for the listening pleasures while enjoying the whirlpool tub. 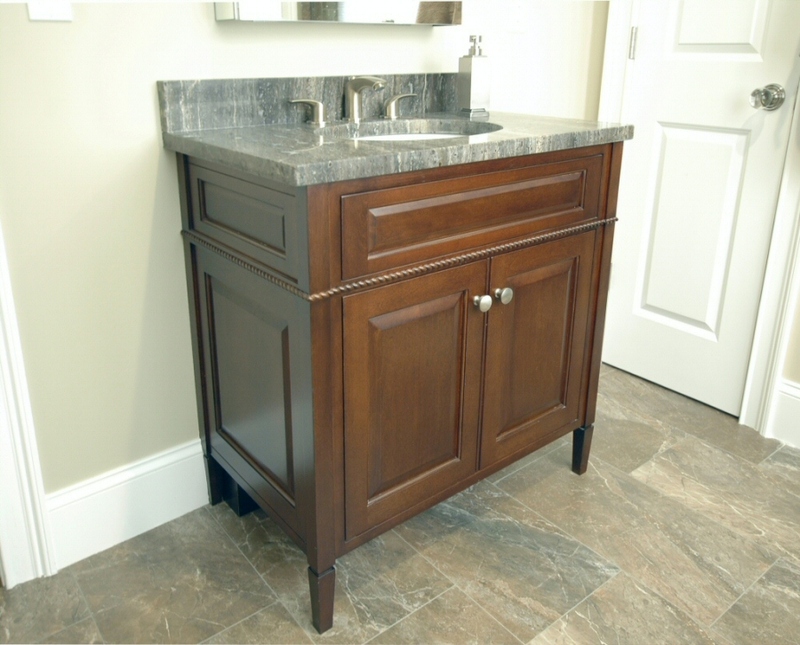 This vanity resides in East Granby, CT. This picture was taken in my shop before the vanities were installed, should be updated soon. This is a modern concept vanity that the client designed herself. The segmented legs are shaped as half footballs. The vanity has 4 drawers and the center is void so the plumbing can be run. It is made from Soft Maple and stained a medium brown. This vanity resides in West Hartford, CT. This is a modern vanity that the client designed herself. 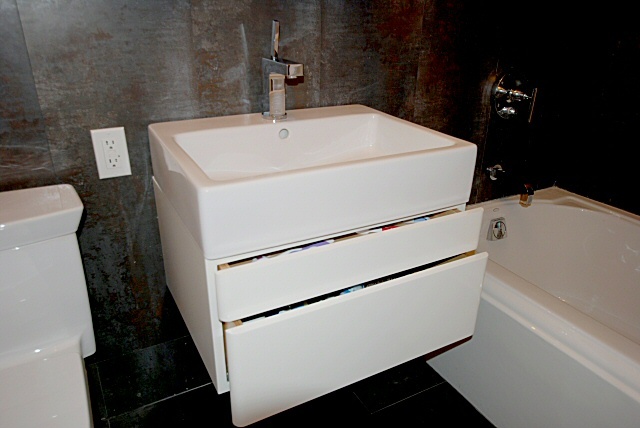 The floating vanity design supports the sink and is the same size to make a sleek looking combination. The two drawers are notched in the center to allow for the plumbing and to maximize drawer space. 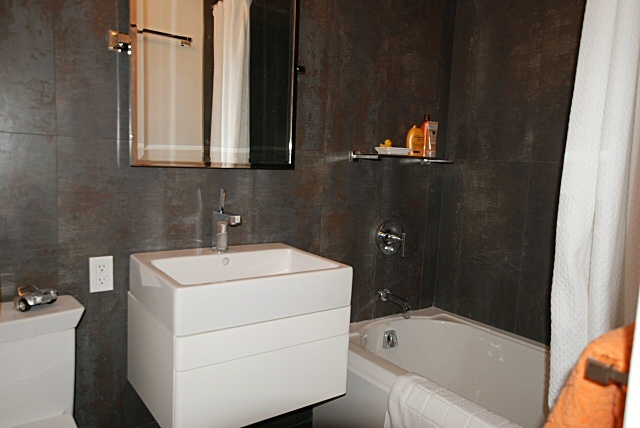 It is painted gloss white to try to mimic the porcelain look of the bathroom fixtures.